An introvert salesperson? Isn't that an oxymoron? Not at all. Sales is a skill just like any other, which anyone can learn and master--including the introvert who is more comfortable alone than in the sales field. As with finding any type of success, it's all about learning how to leverage one's own natural strengths.Extroverts are rarely short on words, and their conversations and sales pitches never feel sales-y to them. The world of sales just comes natural to the extrovert. But introverts aren't comfortable with traditional tactics like aggressively pushing a product or talking over a customer's objections. 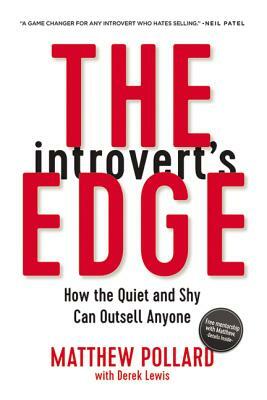 What makes The Introvert's Edge so powerful and practical is that it explains how the introvert can feel equally comfortable and sincere in the sales world as well--without changing who they are Within these pages, the introvert can learn how to find natural confidence, prepare for every situation, sidestep objections that would otherwise expose their uncomfortableness, ask for the sale (without asking), profit from a process that doesn't rely on personality, and simply enjoy sales The introverted salesperson is no longer an oxymoron--it's a recipe for success. MATTHEW POLLARD, known as "The Rapid Growth Guy," works with businesses around the world, from startups and service professionals to Microsoft and Capital One. Responsible for five zero-to-million-dollar businesses, he also founded Austin's Small Business Festival, now nationwide. A native of Australia, he now lives in the United States. DEREK LEWIS is a business ghostwriter who works with leaders from the IMF, SAP, and the Red Cross, among others.